In the beginning there was a name...'Lakewood'. Had I known how often I would be asked about its meaning, would I have chosen another name? No, even after all these years and so many questions, I remain happy with the name Lakewood which has now become entrenched in the awareness of guitar history. The Lakewood adventure began in the spring of 1986. I had some years previously completed my training under master luthier, Manfred Pletz, and was endeavouring to find my niche as an independent luthier. Due to musical preferences I graduated from nylon string classical to steel string guitar. Germany in the mid-eighties was a country of classical guitars. Steel string models naturally originated in the USA or perhaps as facsimiles from Japan. So I was very motivated to do something about this and put Germany on the acoustic guitar world map. But I have omitted to introduce myself: my name is Martin Seeliger and with me everything must start somewhere. I was 28 years old and very curious. This is still the case today, to the inspiration and sometimes the frustration of those working with me. Way back then when I was searching for a name for my steel string guitars, my finger stopped on a map at a small town ‘Lakewood’ on Lake Erie in the USA. The name just suited guitars so I decided there and then and have never regretted it. 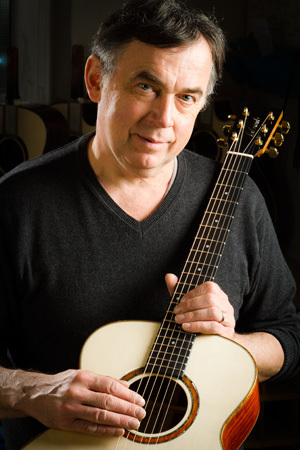 Lakewood became a German steel string guitar brand. Since those early years much has been achieved. Over 20 000 guitars have been created which could tell many a story and which have become part of many diverse lives. This history represents an obligation for all of us at Lakewood. A Lakewood represents a piece of luck. On behalf of all Lakewood colleagues.